Raw creamy vegan miso soup is made with mellow miso, mushrooms, hemp hearts and cashews, and blends up into a delicious healthy vegan soup! 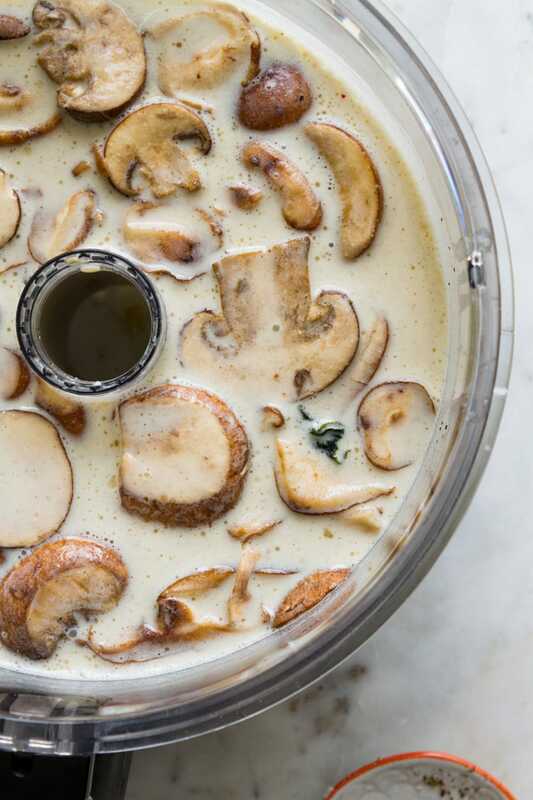 This mushroom vegan soup is so easy to make, and be can be enjoyed all year long as a starter or a complete meal. It’s light, healthy and packed with umami flavors. Miso is very good for you and contains all essential amino acids, making it a complete protein. It stimulates the secretion of digestive fluids in the stomach, restores beneficial probiotics to the intestines and is a quality source of B-12. It’s also high in antioxidants to fight free radicals, strengthens the immune system and so much more. Miso is highly beneficial and I recommend getting to know your miso! I have both yellow and white miso on hand, each one having their own flavor. The yellow is somewhat sweet, and the white is earthy and hearty. I use miso to make a nice cup of warm miso broth in place of tea or coffee. 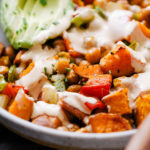 Its versatile and can be used many ways like this Tahini Miso Dressing-Dip, Carrot Miso Soup, or this Easy Vegan Mac and Cheese with Peas. It’s handy and welcome in my kitchen essentials, and lasts up to a year+ in the fridge. See all Miso recipes on TSV! And now gather your ingredients and let’s make some beneficial miso soup! 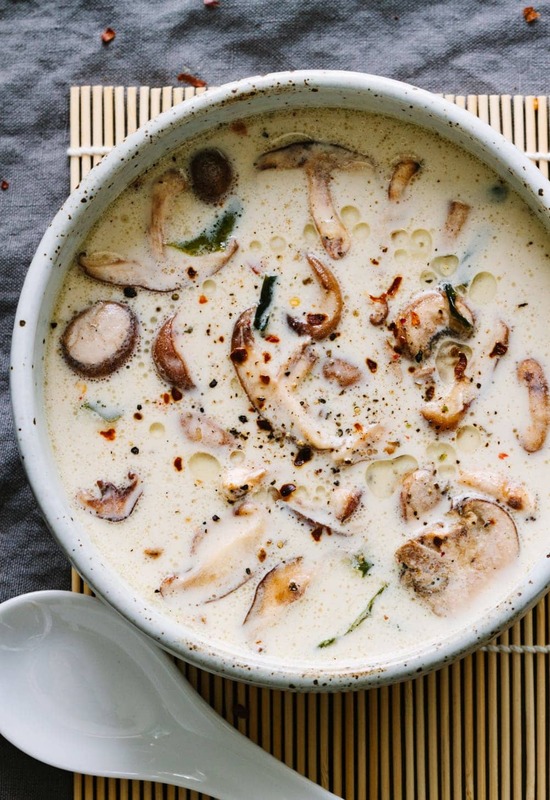 Where to begin with this Raw Creamy Mushroom Miso Soup, except to start by saying how incredibly good it was! 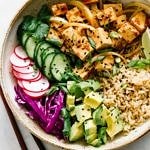 I’ve been wanting to do a raw vegan miso soup and came across this recipe in my Matthew Kenney, Everyday Raw Express, (< affiliate link) recipe book. The only changes I made were adding red pepper flakes & baby bella mushrooms to the mushroom mix, as well as using hemp hearts instead of pine nuts in the soup base. I was a bit skeptical at first but the combination of the broth and the mushrooms mixture blended for an incredible sensation. It was delicious and I enjoyed every last drop! 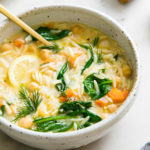 For me this soup was very filling as is, I didn’t need any breads or other grains in addition, although a nice crispy whole grain bread or cracker of sorts would be great to dip capturing the creamy goodness and great flavors of this soup. 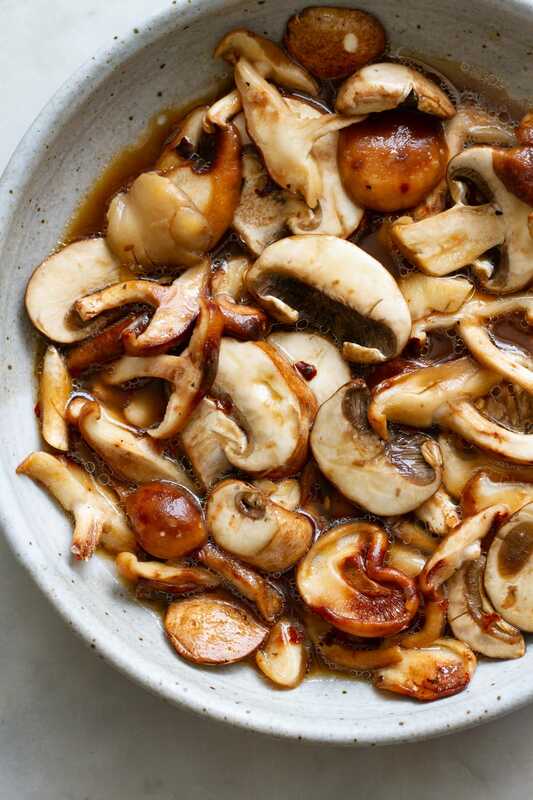 Mushrooms: Start with the mushroom mixture by combining the mushrooms with olive oil or broth, tamari, lemon/lime juice and red pepper flakes. Allow to marinate for at least 30 minutes, stirring occasionally. I really love the flavor of the lemon in the marinade, it’s perfect once combined with the soup. Miso Soup: In your blender, place the water, miso, hemp hearts, cashews, and pure maple syrup, blend until smooth (I used a food processor here, but recommend sticking with a blender). Taste for flavor, adding mineral salt & pepper as needed. It will have some froth on top, you can either leave it or scoop it off. I scooped most of it off. Add wakame/dulse, let them absorb the soup. 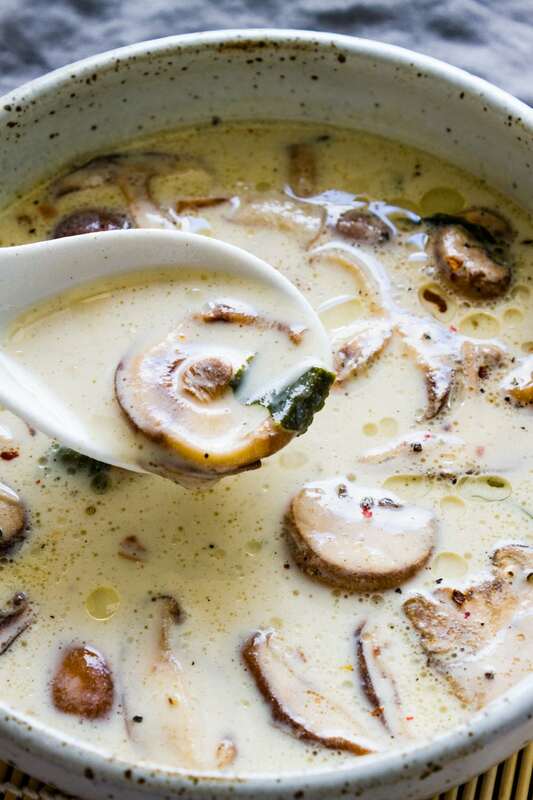 Combine: Once mushrooms are ready, add the marinated mushrooms, with juices, to the blended soup, and give a good stir. Serve as is or garnish with scallions or diced shallots if you like. Also, feel free to warm slightly before serving, place soup in medium/large pot over medium heat, heat until just warm. Use your favorite mushrooms! I used a combination of shiitake and crimini mushrooms here as they came in variety pack, and I love this combination. But oyster, enoki, or white button mushrooms would all be great too. 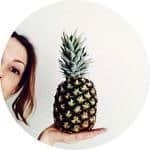 Don’t skimp on the lemons, I called for juice of 2 lemons, that’s about 2 – 3 tablespoons which is perfect, adding a nice brightness to the marinade. I’ve used a little sesame oil in my mushroom marinade, but feel free to omit the oil, using 3 tablespoon of veggie broth instead. A very small amount of toasted sesame oil would be nice here, just start with a little as the flavor is strong and a little goes a long way. For extra protein, add a serving of cubed tofu. 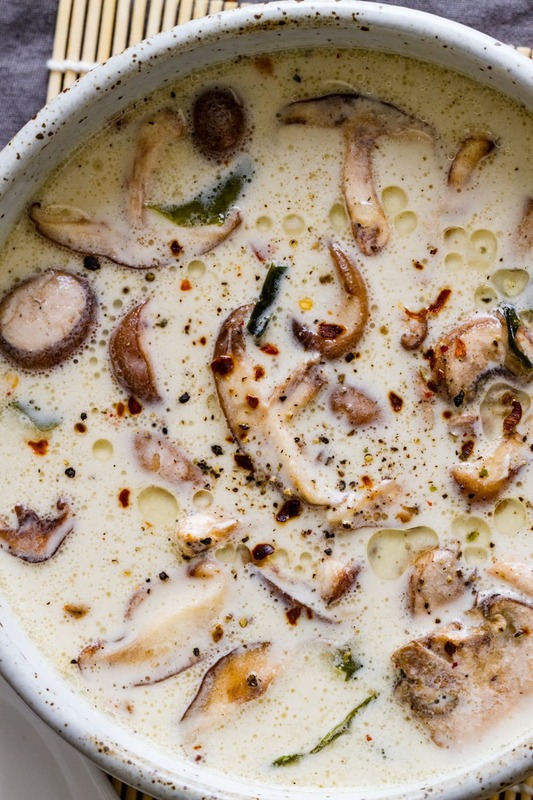 If you try this recipe, mushroom miso soup please let me know! Leave a comment and rate it below. I love to hear what you think, or any changes you make. 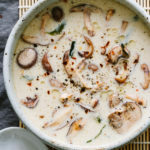 A delicious raw, creamy vegan mushroom miso soup! 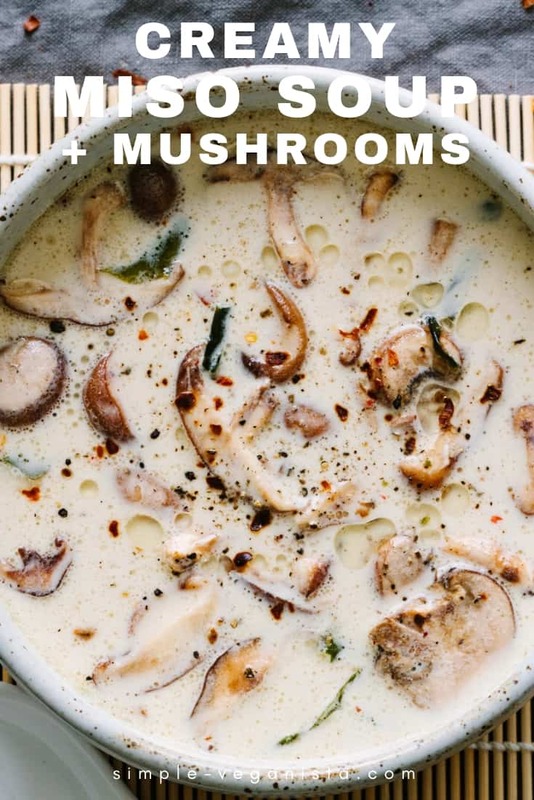 Mushrooms: Start with the mushroom mixture by combining the mushrooms with olive oil or broth, tamari, lemon/lime juice and red pepper flakes. Allow to marinate for at least 30 minutes, stirring occasionally. 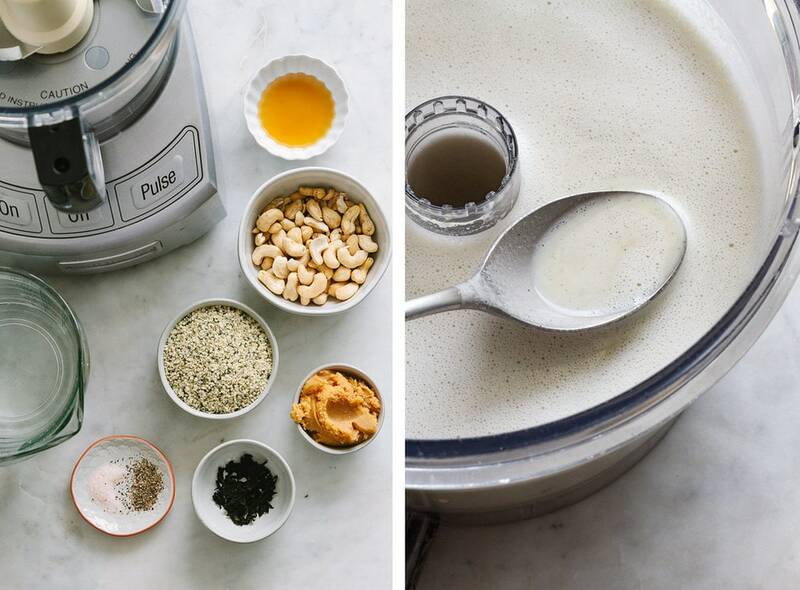 Soup Base: In your blender, place the water, miso, hemp hearts, cashews, and maple syrup/agave, blend until smooth. Taste for flavor, adding salt & pepper as needed. It will have some froth on top, you can either leave it or scoop it off. I scooped most of it off. Add wakame/dulse, let them absorb the soup. Combine: Once mushrooms are ready, add the mushroom mix to the blended soup, give a good stir. Serve as is or garnish with scallions or shallots if you like. Also, feel free to warm slightly before serving, place soup in medium/large pot over medium heat, heat until just warm. **The wakame was given to me by a friend and was on hand. Because of its many health benefits I will purchase again when I run out. If you don’t have it stocked or it’s hard to find, don’t worry about it, the soup will still be great! It’s a sea vegetable (seaweed), you may consider stocking a package. 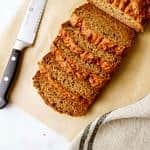 It comes dried and will last a long time in the pantry. Wakame contains omega 3, and also has high levels of calcium, iodine, thiamine and niacin along with many other health benefits. Use it sparingly here and there – maybe in a nice warm cup of miso broth with some silken soft tofu cubes.